Here’s what investors should be focusing on regarding Berkshire's business, stock portfolio, and cash hoard. Berkshire Hathaway (NYSE:BRK-A) (NYSE:BRK-B) reported its third-quarter earnings over the weekend, and the company handily beat expectations with profits doubling from the same quarter a year ago. While this is certainly good news, it's always important to look beyond the headline numbers. With that in mind, here's what investors need to know about Berkshire's business performance during the third quarter, as well as what we know so far about the closely watched stock portfolio. Since Berkshire Hathaway is an insurance business at its core, let's start there. Berkshire recovered nicely from the disaster-packed third quarter of 2017, earning a $1.68 billion profit. And, the profit was divided between the two ways insurance companies are supposed to make money: underwriting and investing. The bulk of the insurance profits (73%) came from investment income, which was 18% higher than a year ago. And, after posting a big loss in the third quarter of last year, Berkshire's insurance businesses ran a $441 million underwriting profit. My fool.com colleague Jordan Wathen published an excellent breakdown of Berkshire's earnings, which you can read for all of the numbers, but the general idea is that Berkshire's operating businesses are firing on all cylinders. In addition to Berkshire's insurance profit, its BNSF railroad unit's net income rose by 34% year over year, and the company's utilities segment grew its net income by nearly 15%. And finally, the manufacturing, services, and retailing (MSR) segment, which includes all of Berkshire's businesses that aren't insurance, railroads, or utilities, eared a $2.1 billion profit -- the best of all of the segments. According to the numbers in Berkshire's earnings report, the conglomerate spent $14.4 billion in its stock portfolio. However, we don't know what the company bought just yet, for the most part. Buffett said in a recent interview that Berkshire added to its Apple (NASDAQ: AAPL) stake during the third quarter, but we don't have any details beyond that. For the full details of what Berkshire bought and sold during the quarter, we'll have to wait until the company's 13-F filing is made public in mid-November. The third quarter was the first time that Berkshire's new buyback policy was in place, and Buffett and Vice Chairman Charlie Munger may now use Berkshire's cash to buy back stock whenever the two men agree that it's trading at a discount. They certainly took advantage -- as it was revealed that Berkshire bought back $928 million in stock in August. Here's the key takeaway: Less than a billion dollars spent on buybacks isn't a very significant sum in the context of a half-trillion-dollar company like Berkshire. However, the buybacks represent the idea that Buffett and Munger both agreed that Berkshire was trading at a significant discount when the buybacks were made. During the window when the buybacks took place, Berkshire was trading in a range of about $204 to $209, so given the stipulations of the new buyback policy, it's fair to conclude that Buffett and Munger both consider the stock cheap at that level. After a few years of an ever-increasing cash hoard, Berkshire has started to find ways to put its cash to work in 2018, and the third quarter was no exception. Including buybacks and yet-to-be-revealed stock purchases, Berkshire spent all of its profits and managed to shrink its cash stockpile by $7.5 billion to $103.6 billion at the end of the quarter. However, don't be surprised if Berkshire's biggest moves of 2018 so far were made after the third quarter. The volatility and large stock market drop didn't occur until October, and the third-quarter earnings report only covers through Sept. 30. These are the times when Buffett loves to put money to work. 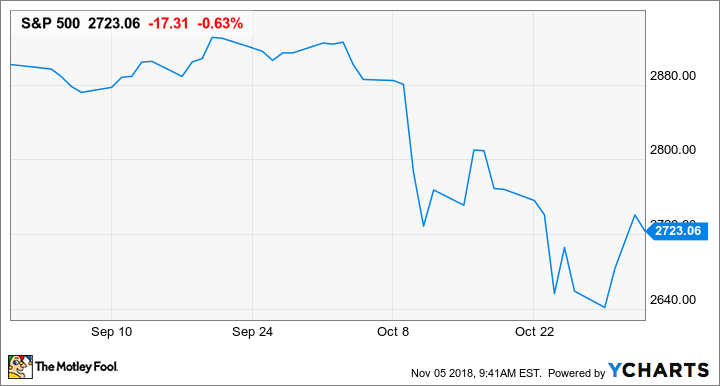 While we have no idea what (if anything) Buffett was buying, just to name a few of Berkshire's stock positions, since Sept. 30, Apple has fallen 11%, Bank of America (NYSE: BAC) is down more than 9%, and Wells Fargo (NYSE: WFC) has dropped 7%. Again, we don't know what Buffett and his team were doing during the recent market volatility. Having said that, I have a sneaking suspicion that Berkshire's fourth quarter earnings report and stock purchases will be the most interesting of the year.